New environments: Temple to the Marshes is a crumbled ruin crawling with stone creatures come to life. New obstacles: Take nothing for granted in the Pixel Kingdom. Meteors, flowers, and mushrooms can help you as easily as hurt you. New enemies: Interact with brand new creatures in different ways depending on Pip’s resolution! 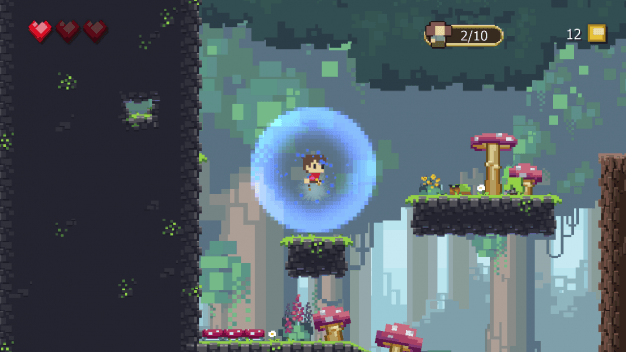 Adventures of Pip is an action-platformer releasing on Steam (PC/MAC), Xbox One, Xbox 360 and PS4. You play as Pip, an unlikely 1-pixel hero in a 32-bit world with the unique ability to absorb the pixels of his defeated enemies to evolve into three different forms. The game features a soundtrack by Jake “virt” Kaufman, composer for Shantae and the Pirates Curse, Bloodrayne: Betrayal, Shovel Knight, and more. This game was made possible through a very successful Kickstarter campaign held in October 2014, blasting past their goal with 164% funding thanks to the support of 2,500+ backers. In a mere three months, Pip’s hi-fidelity adventure will finally begin.